Create professional emails to attract attention & grow your business. Email Marketing is one of the most powerful online marketing tools businesses and organizations utilize due to it’s high ROI of about $38 back for every $1 spent. This is why Email Marketing should be part of your marketing plan to drive sales, grow customers and keep them informed. 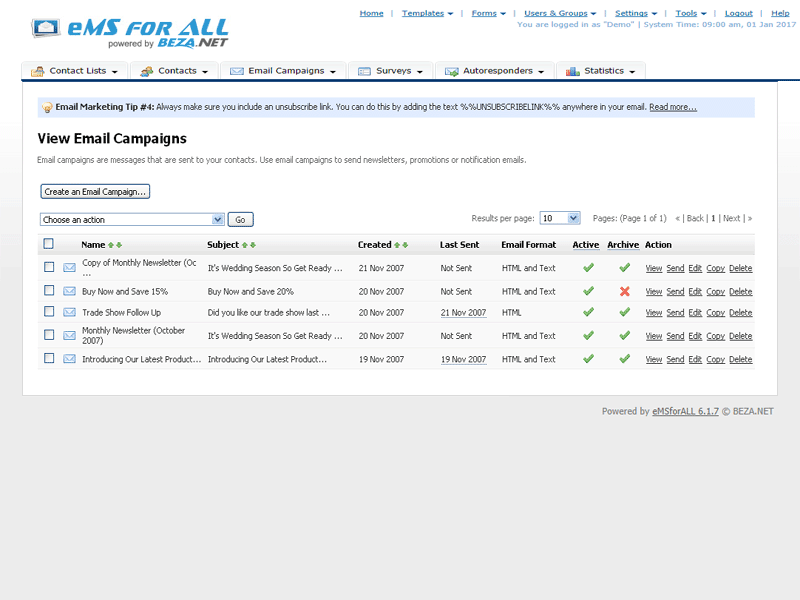 The Email Marketing Solution for ALL (short for eMSforALL) is a BEZA.NET service offering customers a powerful and easy to use solution. Our all-in-one email marketing service includes everything you need to create, send, track and profit from email marketing – but it doesn’t stop there. It also includes powerful tools to completely automate your follow up marketing and customer feedback loops FREE of charge. The eMSforALL service offers the same tools enterprise businesses use but without the added complexity or costs. So, sign-up today and see how you can start benefiting from all of the capabilities and benefits the eMSforALL has to offer. using autoresponders. 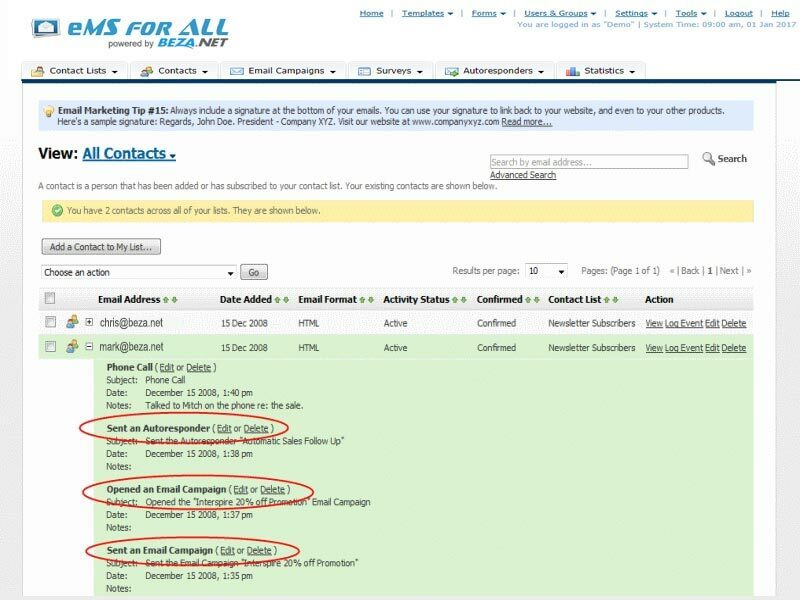 Send a series of personalized email messages to new leads at intervals you define. It’s like having your own dedicated sales team working for you around the clock. with A/B Split testing. 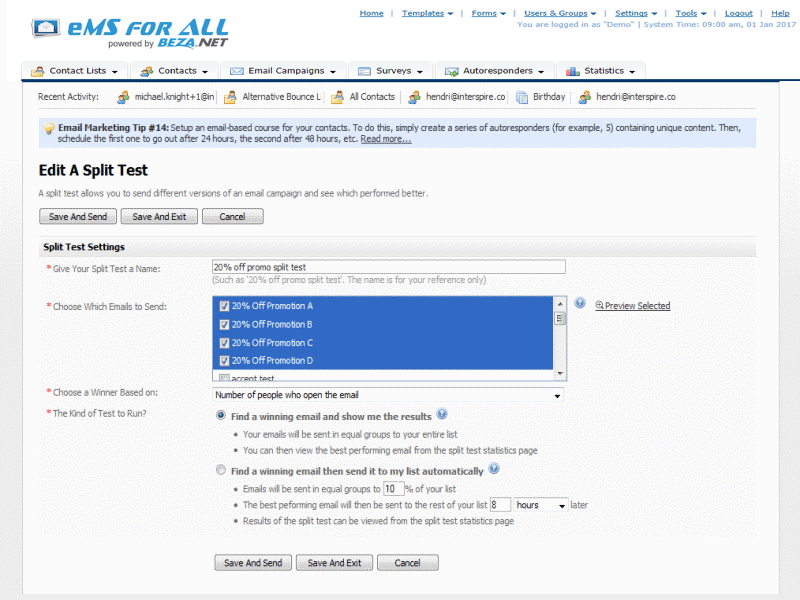 Send a few variations of your email to a sample of your list and have the best performing one sent to the rest automatically. with triggers. 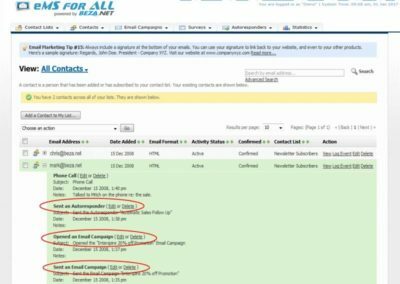 Automatically convert leads to opportunities when they open a specific email, remove inactive leads from your list or even send a follow up email when a particular link is clicked – automatically. with automated bounce processing. Invalid email addresses can be removed from your list automatically based on “smart bounce rules”, helping keep your deliverability rate high. 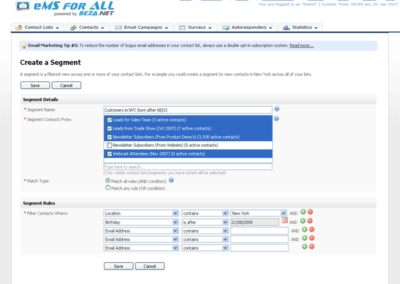 Upload your existing email campaign from your computer or import it from a web page. 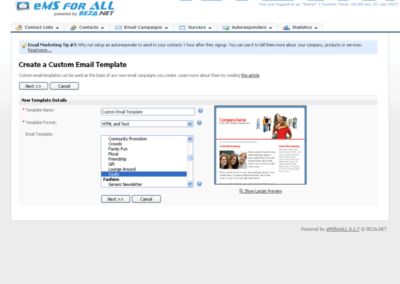 Our templates have been tested to work in all popular email clients (including Gmail, Outlook, Yahoo). 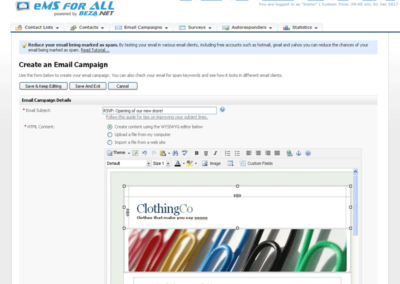 Use the built-in WYSIWYG editor to make changes to your email campaigns quickly and easily. See exactly how your email will look before you send it. You can view a preview or even email it to yourself. Our professional designers can design email templates which are very engaging and highly converting. Personalize your email with two clicks using custom fields such as first name, age or company name. 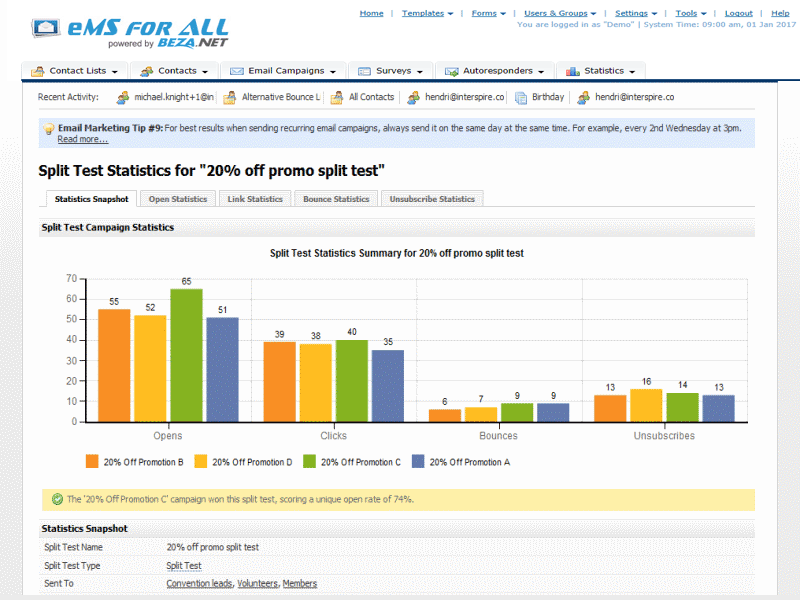 Advanced users have full access to customize the HTML of their email campaigns. 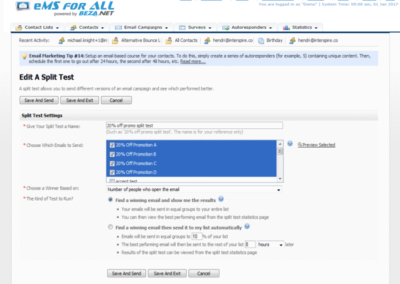 Upload as many images as you like into your email campaigns. Unlimited free image hosting is included. 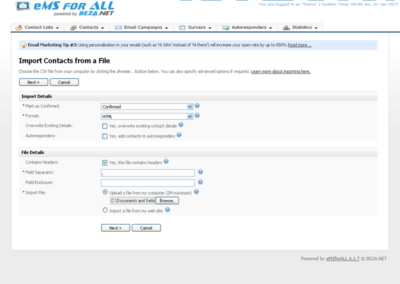 eMSforALL allows you to create multiple, sequential autoresponder emails for each of your contact lists. 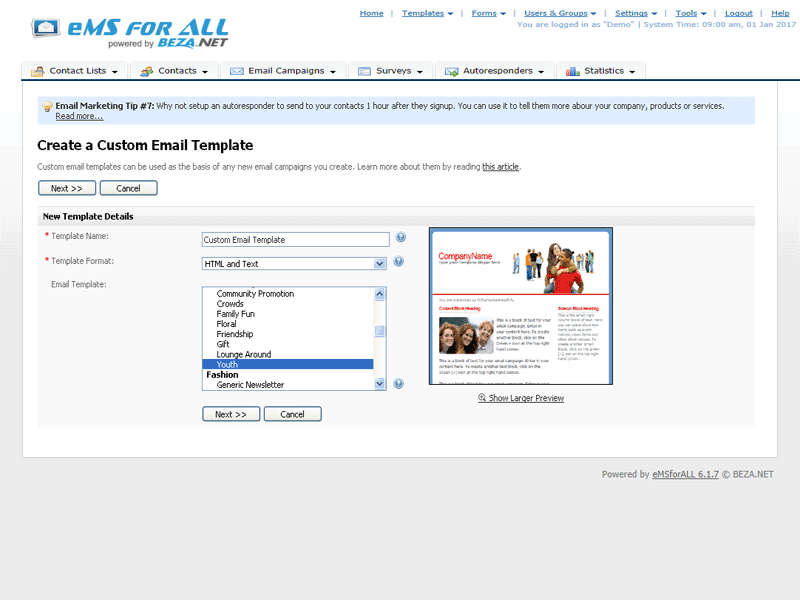 eMSforALL offers full support for uploading and sending attachments along with your emails. You can assign an autoresponder to your entire list or only a portion of it, such as those in New York, etc. 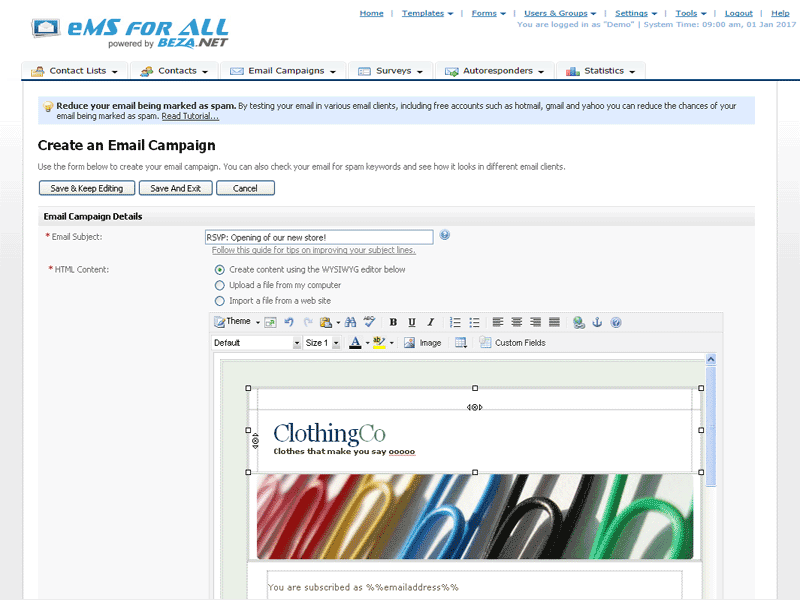 Create beautiful HTML emails, informative text emails or both using the integrated campaign editor. 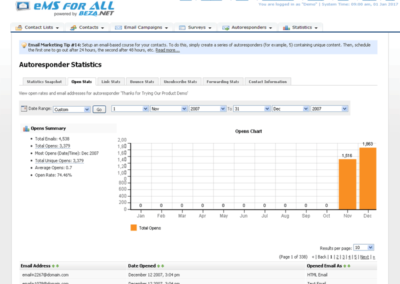 Just like email campaign statistics you can see who opened your autoresponder, links clicked, etc. You never have to worry about duplicate emails. We guarantee you’ll never find a duplicate email address in your list. All unsubscribe requests are processed for you automatically giving you and your subscribers peace of mind. Bounced emails (both soft and hard) are processed and removed from your list for you automatically. With full support for scheduled sending, you can blast your email out immediately or schedule it to go out at a later date. 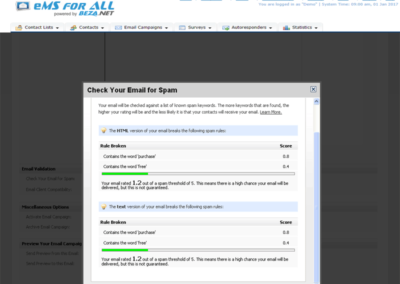 Your email is analyzed for known spam keywords and the spam report ensures high delivery rates before sending campaign. 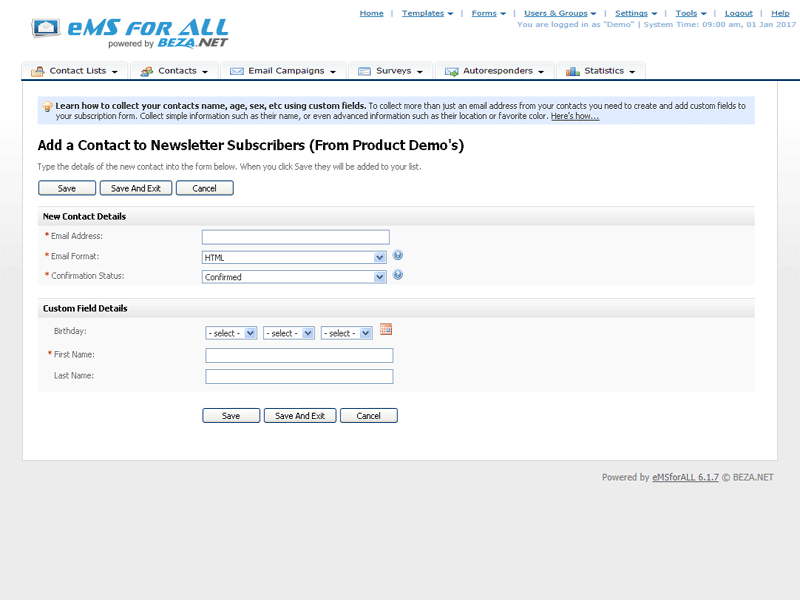 Encourage subscribers to share your email by including a “forward to a friend” link in your email. 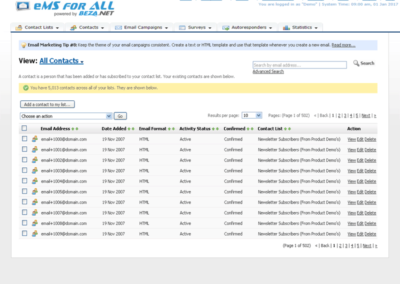 Easily send your email campaign to multiple contact lists in one send and eMSforALL handles any duplicates. 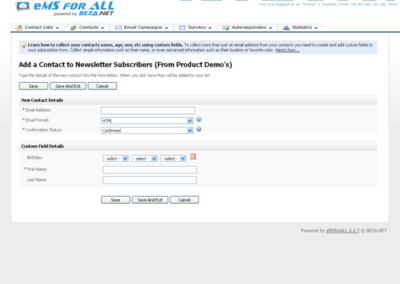 Dynamic content blocks allow you to personalize a section of your email message based on custom field values. 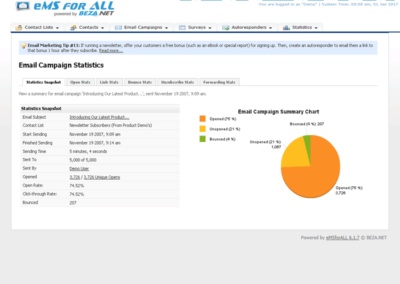 Create beautiful HTML emails, informative text emails or both using the campaign editor. 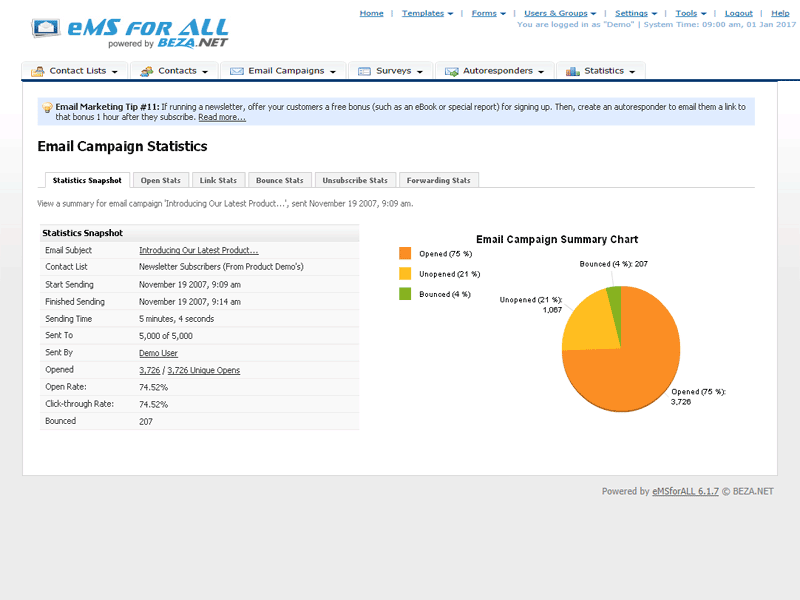 From the statistics tab you can see exactly who opened your email, when and how many times. See which links were clicked, by who and when. Follow up with leads who’ve shown interest. Add Google Analytics tracking code to all links in your email, to measure number of visits, goals and conversion. 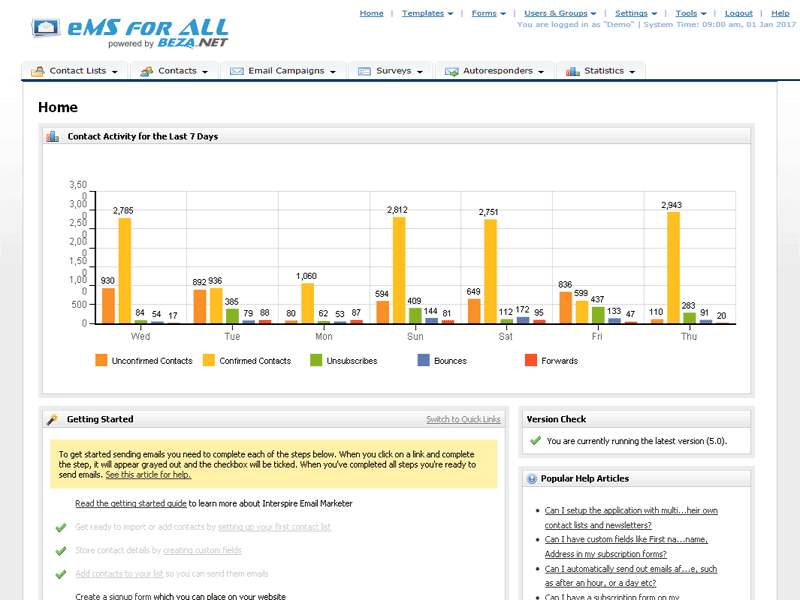 Bounces are handled for you automatically and you can view detailed bounce-back reports. 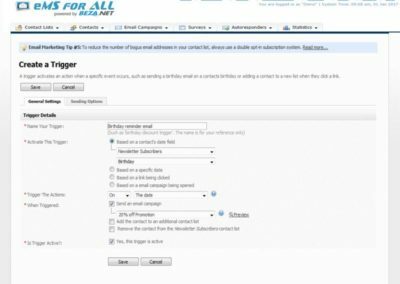 eMSforALL offers a drag & drop editor to quickly create a completely customized survey to send via email. See a complete history of every email they’ve received, which links they clicked and when they opened your emails. 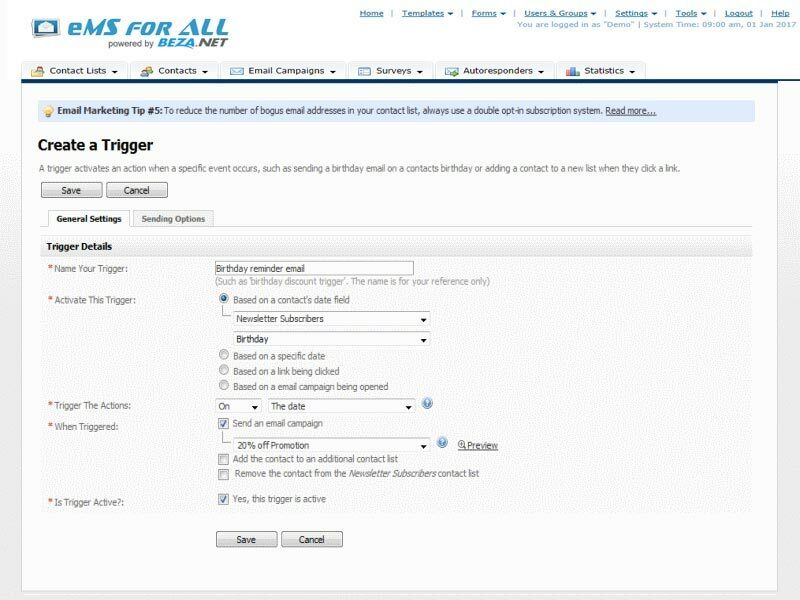 Put your follow up tasks on autopilot with triggers. Send birthday and anniversary reminder or promotion emails, etc. Using the built-in event logging system you can quickly and easily log events such as phone calls, meetings, etc. eMSforALL has full support for your Google calendar. Easily add follow up reminders, etc. 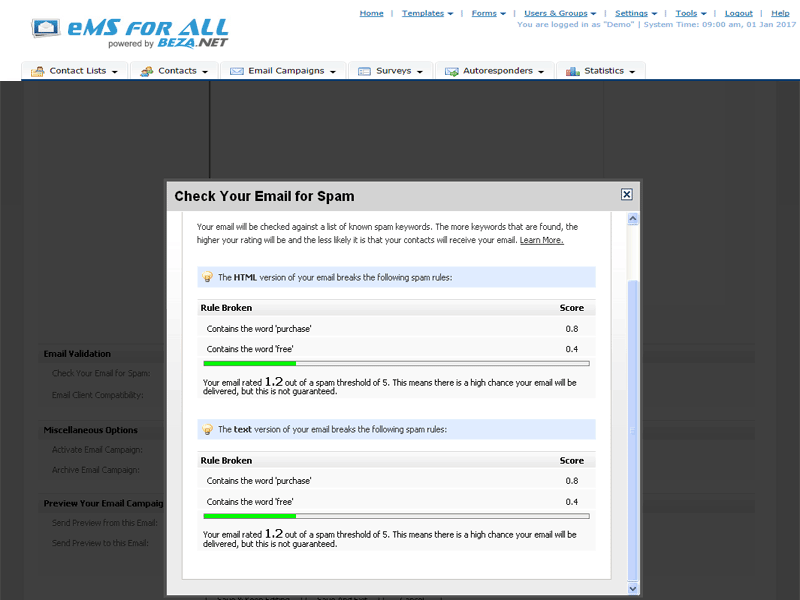 You’ll always be compliant with spam laws and best practices thanks to eMSforALL automatic handling. 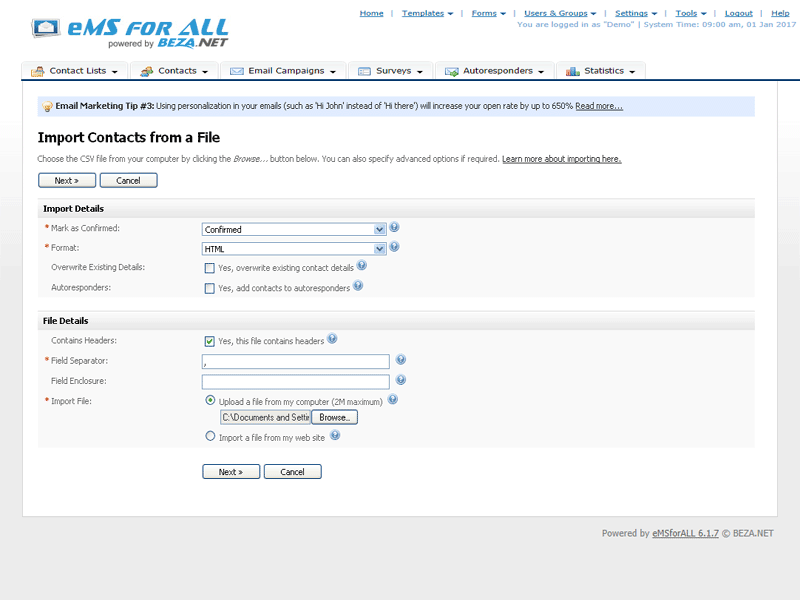 Create as many contact lists as you need, allowing you to group contacts based on type or lead source. 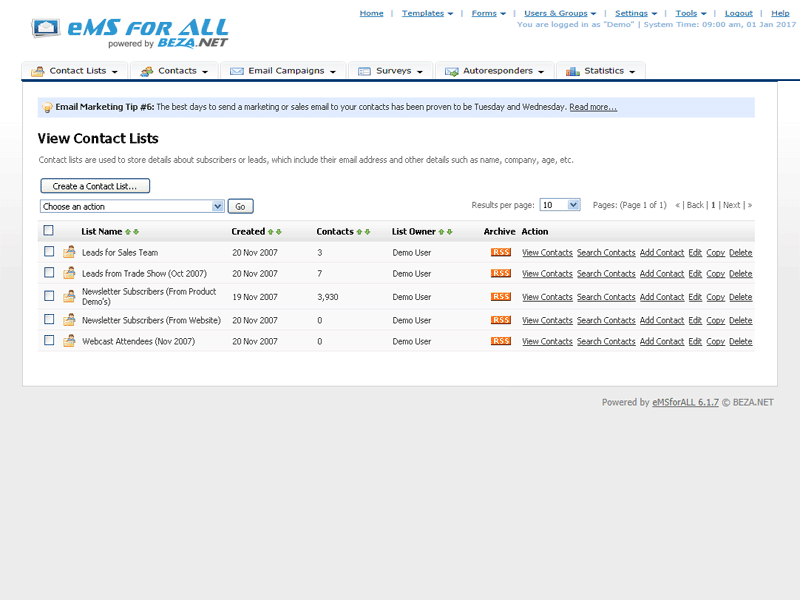 Each contact on your list can modify the details of their subscription, such as email address, first name, and more. 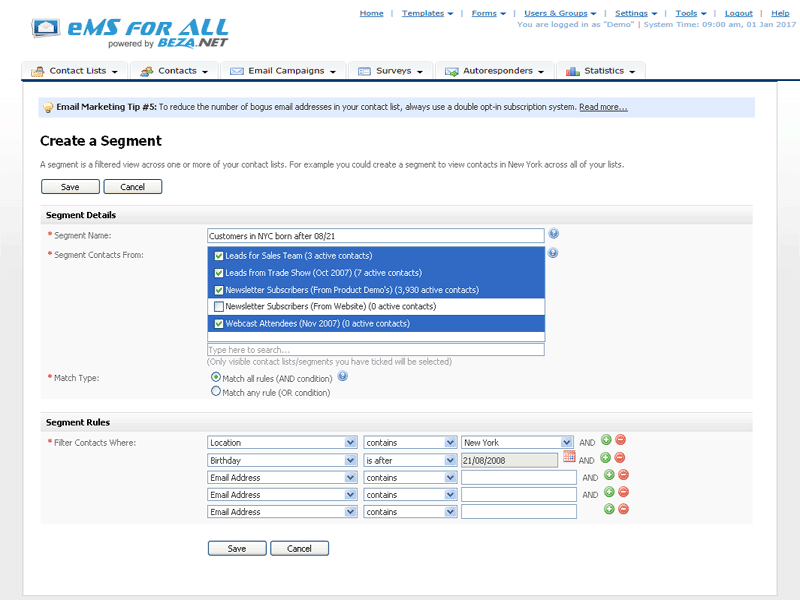 Filter contacts across multiple lists based on common attributes such as location or interests to send emails. When viewing your contact list in “grid mode” you can choose which of the contact’s details appear. Create multiple custom fields to store additional information about contacts such as location, interests, etc. 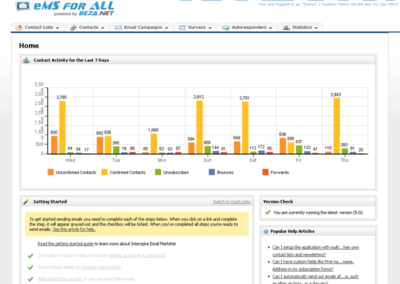 eMSforALL is fully featured email marketing software which can be used to create, send and track email campaigns and autoresponders.